I guess I couldn’t keep how I feel about you to myself too much. You figured me out. I guess you could read me more than what I anticipated. For the longest time I’ve been dreaming of what it would be like to grab your attention. I had it in the palm of my hands for only a little while, but I think it has slipped through my hands. Maybe I shouldn’t read too much into this because there’s nothing too serious going on between us, but I feel like I have ruined something. I had your attention for a short amount of time, and I only did what you wanted. Showed you what you wanted to see. I exposed myself, and that’s something I don’t do for anyone. I don’t let anyone see me the way you’ve seen me. I did it because I thought maybe we could be something. I think you saw too much, and now you don’t want me, or even want anything to do with me. Maybe I’m overthinking. Maybe I’m reading too much into this. This is driving me crazy. I don’t know how to deal with this. I don’t know if I can face you anymore because you have seen all of me. I don’t know if I can handle it. You have made me feel some type way, and you make me want more. I want all of you. This is driving me up the wall, and you know exactly what you were doing, when you expressed your curiosity. I just want you, but I don’t think I can have you. I can’t take you home, and keep you. 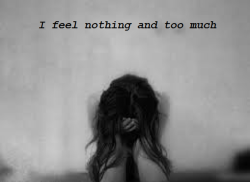 I can’t feel you. I can’t put your lust in a jar, and keep as a souvenir. I’m so confused. You always keep me guessing, and it drives me crazy. This is why I can’t tell you how I really feel. I can’t tell you because you know how to play your cards. I’m a sucker for you, and I simply don’t understand why.